Last weekend I was appalled to find someone had placed a bird trap between a sycamore tree and the burn which I walk the dogs by twice a day. This was 7 am. A young bird in the nest in the sycamore was screaming in alarm, and the parent, caught in the cage was calling back, flapping desperately to escape, battering itself in the confined area. I released the trapped bird. It was reunited with its offspring. I could not get at the decoy bird, it was sealed in. It, too, was very distressed. I memorised the telephone number, completed the walk with my dogs, and rang the number when I was home. I was put through to the police. I asked for the Wildlife Officer, but the one for my area was off for the weekend. I explained what I had done due to the heartbreaking racket of the distressed birds which I was not going to be made to listen to all day. My details were noted and my actions were not judged. I was told my concerns would be passed to the Wildlife Officer by email which she would read on Monday. Then I went out and moved the cage into a closed, fenced off field so that dogs would not add to the distress of the bird. Later in the day a local man, who we knew, arrived and started to put the cage back where it was. My husband went down and had a row with this man but all we could get him to agree to was to move the cage back in the closed field, for the reasons I have already explained. He was sneering all the time though, for he told us the law was on his side and if we tampered with the cage it would be us who would be in trouble, not him. We then rang the police again. This time I asked what the penalty was for freeing a trapped bird. A Wildlife Officer was contacted so that the person I was being advised by could explain. It was a Larsen Cage, perfectly legal. We must not tamper with the cage or we could be prosecuted. I said if the law backed such a wicked instrument of death then I was very disappointed about the direction the law was going. What is wrong with Larsen Traps? Larsen Traps were designed by a Danish gamekeeper in the 1950s but are now banned in Denmark because of their cruelty. They were introduced to the UK by the Game Conservancy Trust (now named the GWCT) – a keen promoter of the game bird shooting industry. Larsen Traps are designed to eliminate a natural indigenous wild species in favour of large unnatural releases of artificially bred game birds, who are destined to be killed for sport. 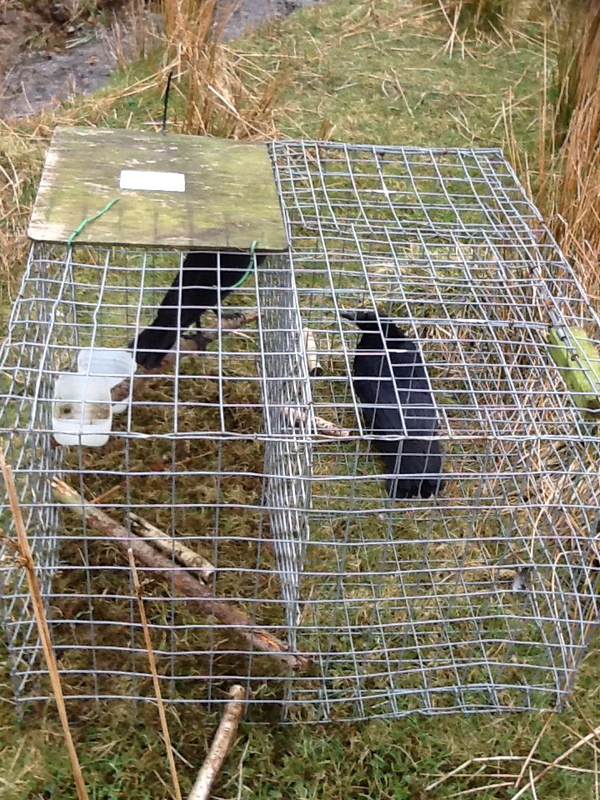 The traps are made from wire and wood and have a compartment where a live decoy bird is kept to take advantage of the corvid species’ territorial or inquisitive behaviour. Set in spring or early summer (the breeding season) when these behaviours are strongest, the investigating bird comes down and falls into a cage trap sprung by a collapsing perch and a swing door. When the gamekeeper returns, the caught birds are ‘dispatched’. Decoy birds are often found dead through neglect or starvation, or can only watch on as other trapped birds are killed. * A wild corvid ‘bait bird’ is routinely and legally incarcerated in a cage. This is not legal or routine for any other wild bird in the UK. * Incarceration causes stress and trauma to the wild bait bird. * The capture of adult birds in the breeding and nesting season causes the distress and death of corvid hatchlings and fledglings. * The traps are set at ground level and expose the bait bird to the trauma of prowling predators. * Gamekeepers abuse the Larsen Trap law and use illegal bait birds to catch raptors and even foxes. * The traps are indiscriminate and catch other species. * The traps are set in England without responsibility. The identity of the trap setter is anonymous. In Scotland, a system of police issued codes identifies the owner of the trap. * The bait bird must be provided with a perch, fresh water and suitable feed. * Bait birds must be protected from pain, suffering, injury and disease. * The bait bird must be provided with shelter from wind, rain and sun. * Larsen Traps should not be used in severe weather conditions or when they are anticipated. * The bait bird must have room to stretch his or her wings. * The bait bird must not be mutilated (wing clipped). * Only corvid birds and certain parakeets may be used as bait birds (not pigeons, who are used to attract raptors). * Larsen Traps must be inspected every 24 hours and any dead birds or animals must be removed. * Trapped birds must be dispatched ‘humanely’. * Larsen Traps must be locked securely when not in use or put out of use by collapsing and storing. * Any person convicted of an offence under the Wildlife and Countryside Act 1981 may not use a Larsen Trap unless they are ‘rehabilitated’ or absolutely discharged. In summary, Animal Aid objects to all traps, but Larsen Traps are particularly cruel. Anybody can set them without further specific permission under the General Licences issued by Natural England and devolved UK governments. People may even set them in their own back gardens. There is little enforcement of the feeble regulations in England and Wales, and little chance of proving responsibility for abuses. The permissive law has been upheld by successive governments, which pander to the game shooting industry. This entry was posted in Uncategorized and tagged corvids, gamekeeping, hunting, inhumane killing, Larsen cage, pheasant shoots, shooting. Bookmark the permalink.